1. Framed botanical prints because it's about time you tossed those Led Zeppelin posters — or at least move them to the basement. Get them from Walmart for $64. Get it from Amazon for $373.99+ (available in three colors, also in a daybed/trundle version). 3. And matching tufted storage ottoman with a lil' more pizazz than the shabby-looking "investment" you picked up in the dorm section the summer before freshman year. You're never too old to appreciate something pretty to hold your junk. Get it from Amazon for $56.06+ (available in seven colors). 4. Seashell bookends ready to hold the tomes you WANT to read instead of those sturdy metal versions that used to corral your textbooks. Get them from Walmart for $26. 5. 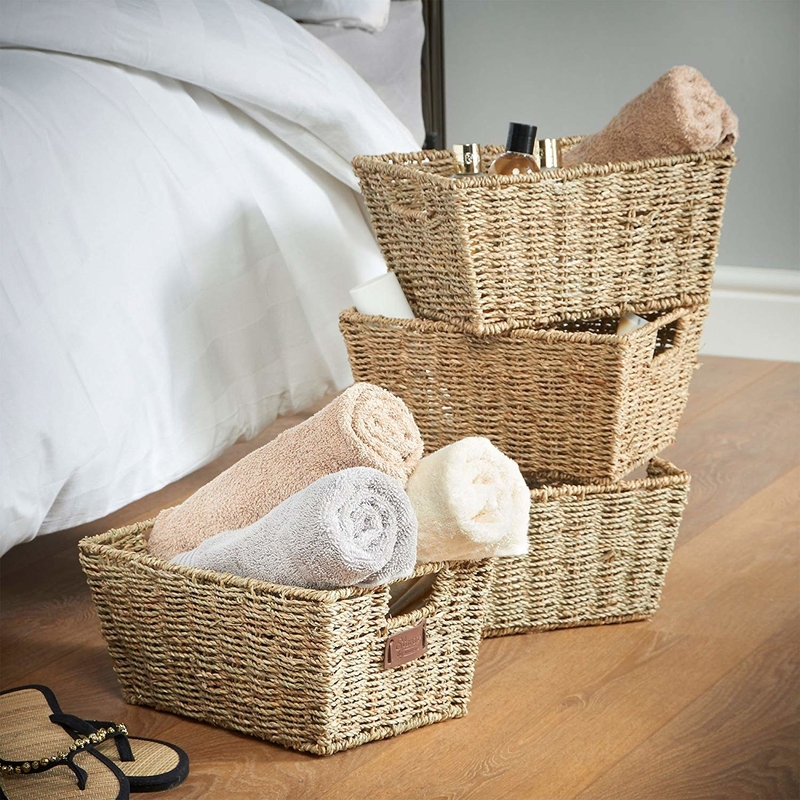 Seagrass storage baskets you can use to hide all kinds of stuff in plain sight. Those rainbow-bright foldable cubes are just calling attention to the stuff you haven't quite found a place for in drawers. Get four from Amazon for $44.95 (also available with lids). 6. And an enormous cotton rope basket to give you a place to throw extra pillows and blankets in if you don't already have a designated area! Get it from Amazon for $31.47+ (available in two designs). 7. A lightweight non-stick pan that'll do SO MUCH more than your worse-for-wear pan that's been your go-to for eons. FYI, this was chosen as our mid-price pick for the best non-stick pans on BuzzFeed Reviews. It got sky-high marks for cleaning, pan capacity, heat resistance, and several more factors. In short, it's legit. 8. Minimalist wooden utensils with silicone parts (and a matching container!) to replace those sad, melted plastic flippers you've been using since you moved out of the dorm. FYI, these silicone-accented pieces can withstand temperatures up to 446°F, and are scratch-resistant and BPA-free! 9. Velvet throw pillow covers for cozying up your spot on the couch AND distracting from how, tbh, you could really use a new sofa. Get two from Amazon for $11.99+ (available in six sizes and styles, and 27 colors; also available in single pillow covers). 10. Titanium ceramic cookware with a non-stick coating safe for induction cooking that'll motivate you to bring some of those delicious recipes you keep saving on Pinterest into real life. Includes a 9.5" fry pan, 11" grill pan, 2-qt. saucepan and lid, 3-qt. saucepan and lid, 4-qt. jumbo cooker and lid, 6-qt. Dutch oven and lid, and a recipe book. Oh, and they're dishwasher-safe and oven-safe up to 400°F! Get them from BuzzFeed's Goodful line, exclusively at Macy's for $119.99 (originally $214.99). 11. An adorable (but loud!) alarm clock with a glow-in-the-dark face because maybe it's time you graduated to something other than the series of alarms you have saved on your phone in 5-minute increments. Get it from Amazon for $12.99+ (available in four color combos). 12. Marble swirl–look plates you can put in the microwave *and* dishwasher. Even frozen pizza is going to look amazing in your future flat lays. Includes four table settings with soup bowls, salad plates, and dinner plates. Get them from Amazon for $69 (available in three color combos). 13. And while we're on the subject, some scalloped-edge flatware that won't break the bank – they'll feel like the fancy upgrade your heated-up chicken noodle soup is craving. Includes a service for four with salad forks, dinner forks, teaspoons, dinner spoons, and dinner knives. Get them from Amazon for $17.99+ (available in four styles, and service for 8 or 12). 14. A luxurious faux-fur throw without the luxurious price tag. But, honestly, it costs about the same amount as that novelty fleece throw that you're pretty sure was built for a child but you've been making do with for years. Get it from Amazon for $29.98+ (available in three colors and two sizes). 15. A floor lamp with some ~flexible~ lighting options that won't look like an octopus (ya' know the lamp I'm talking about). 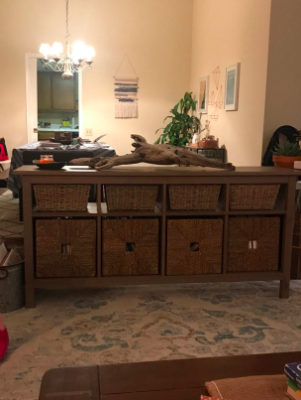 Promising review: "Aside from the fact that the lamp has a very heavy base, which I think we can all agree is vital for a floor lamp, but unlike more expensive lamps I have considered, there are switches on each of the lamp heads. If the heads don't quite swivel a full 360, the are very mobile and do have a lot of flexibility. Also, the lamp includes 3 LED bulbs. 16. A gorgeous velvet headboard because you.... Wait you didn't have a headboard in college? That's fine! Now's the time to invest ;). Get it from Walmart for $349+ (available in four sizes and navy). 17. 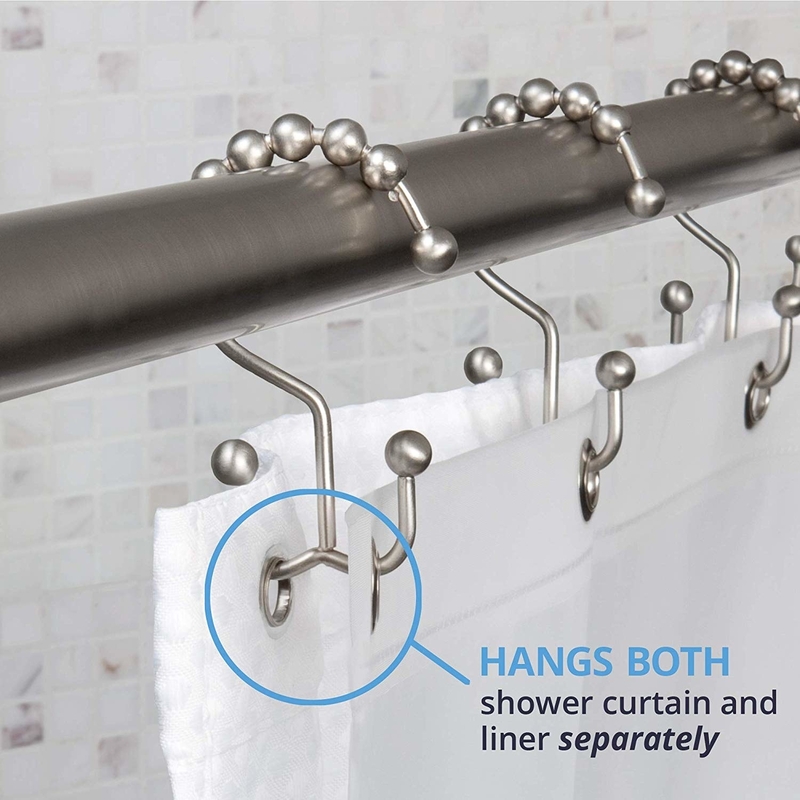 A ~flexible~ shower caddy that'll hold all your toiletries — on the shower head or shower rod. Now that you don't have to carry your toiletries with you every time you shower, you can park 'em where you please. Get it from Amazon for $17.14+ (available in three colors). 18. A jute rope rug you can park in front of your front door as a drastic improvement from your OG that simply says "BEER." 19. A glitzy bathroom set to bring some uniformity to your sink area instead of whatever OK-smelling hand soap was the cheapest at T.J.Maxx on your last haul. Get them from Amazon for $19.95+ (available in three colors). 21. A suuuuper soft bath towel (or even a bath sheet!) that'll prove it's the best investment you'll use every single day. What's the difference between a bath towel and a bath sheet? A bath sheet is larger and you can straight up wrap yourself in it, much like a bed sheet! But not as large as a bed sheet. Really, you aren't living if you aren't using bath sheets. I've been using Snowe bath sheets for 3+ years and they just get softer over time. Oh, and these towels were our mid-price pick for the best towels on BuzzFeed Reviews. 22. 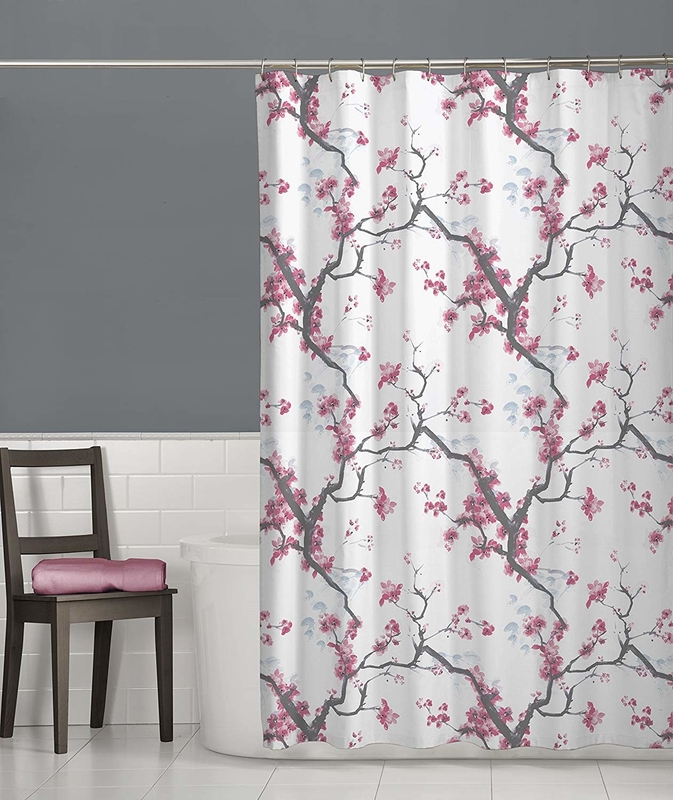 An *actual* fabric shower curtain and easy-glide hooks because that cutesy plastic curtain and round plastic hooks are no longer cutting it. 23. A pretty jewelry organizer wth all the bells and whistles that tangled box of baubles or stick-on wall hooks just can't muster. Get it from Amazon for $34.95 (available in three colors). 24. Skinny velvet coat hangers with grip for days that'll take so much better care of your stuff than those miscellaneous wire and store hangers you've been collecting all this time. I own these and love them! Seriously, no more slippage with tops and dresses. Plus they bring a gorgeous uniformity to my closet. And I'm not the only one! Check out our full review on the Prince & Spring non-slip hangers. Get 35 hangers from Boxed for $9.99. 25. A cool coffee table with more ~levels~ than that ho-hum flat pack one you just stopped using coaster on because why even bother. Get it from Amazon for $53.70. 26. Luxuriously comfy pillows so you can enjoy some vacation-level sleep on a Wednesday night at home. You and I both know we don't wash or change out our pillows often enough. Oof. These were our budget pick for the best pillows on BuzzFeed Reviews. Go ahead, treat yourself (and your poor neck!) to some actual support. Get two from Amazon for $29.99+ (available in queen and king). 27. A nicer bookshelf than that ole' Billy from IKEA that has some stories. to. tell. Get it from Amazon for $69.99+ (available with four or five tiers). Also check out a similar folding bookshelf! Get them from Walmart for $9.78. Get 10 17 oz. glasses from Amazon for $34.88. 30. And a wooden desk organizer in case you actually miss your dorm desk with all those built-in nooks to stash your stuff. This'll help you get your desk in order at home or at work!